Right now, as brilliant fall foliage creeps south across the continental U.S., there is an opportunity to teach a significant amount to students about how colors are created in nature. All children know that leaves change color once autumn rolls around, but few understand why the change happens, or how some other prominent colors in nature are created. Leaves don’t so much change color as they lose their green. During the spring and summer, the chemical chlorophyll in the leaves of trees helps them turn water and carbon dioxide into sugar and oxygen. This process, called photosynthesis, provides the food the tree needs to grow. Chlorophyll is what gives the leaves their green color. As winter approaches, there is no longer enough sunlight or water to manage the chemical reaction of photosynthesis, so trees shut down the process. 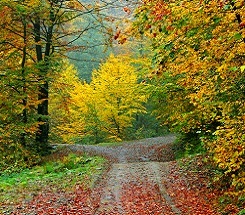 The green chlorophyll vanishes from the leaves, and only yellow and orange colors are left. Those colors were there all along, but were masked by the strong color of the green chlorophyll. Eventually those leaves drop, and the tree remains dormant until it is time to put chlorophyll to work again the next spring. Among the changing leaves, students might be able to locate a bold blue bird. But, a blue jay isn’t truly colored that way. Not all colors in nature are created using pigments, and the blue color of birds is just such a case. Blue jays, bluebirds and Indigo Buntings all produce their dazzling blue colors by dispersing light. Small pockets of air between the barbs and ridges of their feathers scatter light. The resulting color is blue. However, the feather itself is not blue. If you backlight a blue jay’s feather, it will appear to be a dark brown or black color. This is because the blue you see requires direct, incoming light. The green colors on most birds are made by a combination of this blue structural color and a natural yellow pigment. In fact, the only known bird to produce its own green pigment is the turaco, a sub-Saharan bird. Other birds gain their distinctive color by diet. Flamingoes, for instance, appear bright pink because of the crustaceans they consume. Small shrimps in shallow pools start out eating plant material high in carotenoid pigments, which contain protein molecules that are green or blue. Flamingoes forage by holding their head upside down and sucking in water. They use their tongue to filter the water back out of their beak, keeping the shrimps inside. When the flamingoes eat the shrimp, the shrimp’s pigments liquefy into fats that are laid down into the bird’s growing feathers. This is what turns them pink. Zookeepers have to take this diet into account when they house flamingoes. They feed the tall birds a special diet of pellets that contains the appropriate pigment. If they keepers failed to do this, the next time the flamingo molted its old feathers they would have a drab, pale bird on display. Everyone knows that polar bears are white, right? Well…really that is not the case. They are actually black beneath all that thick fur. Though their skin is black, they do appear white because of the way that their hair works. None of the hair on a polar bear contains pigment, which is what gives living objects their color. The individual hairs have a hollow, transparent core. This setup scatters visible light in much the way that snow scatters visible light. Because the all the visible light is scattered, there is no color to see, thus they appear white. Polar bears have been known to exhibit a green color in zoos. In these cases, colonies of green algae have grown in their hollow hair shafts. It takes a salt solution to kill the algae and restore the bear to its normal-looking white color.